Can you believe it? 2016 has just flown by, December is here and Christmas decorating is in full swing. 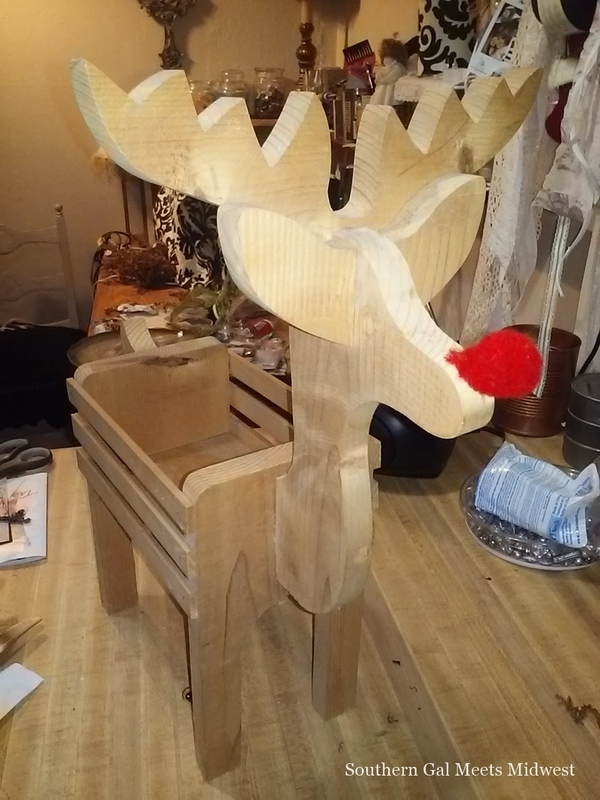 This year I am making many of my ornaments and other decorations from thrift store finds or things I have had for a long time. Anything woodland/cabin or rustic has really caught my eye this season, I love it all! 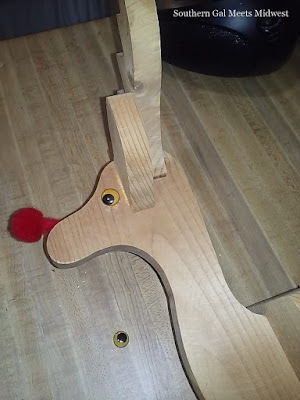 This wooden deer is what got me started. Mama gave this to me several years ago (she was gonna give it to Goodwill) and I have not done much with it until now. This poor guy is very old and wobbly and it was super easy to take him apart. So I unscrewed the head and will use the back portion for another project. There are lots of fun deer wreaths out there and I wanted to try and create my own from stuff in my craft stash. 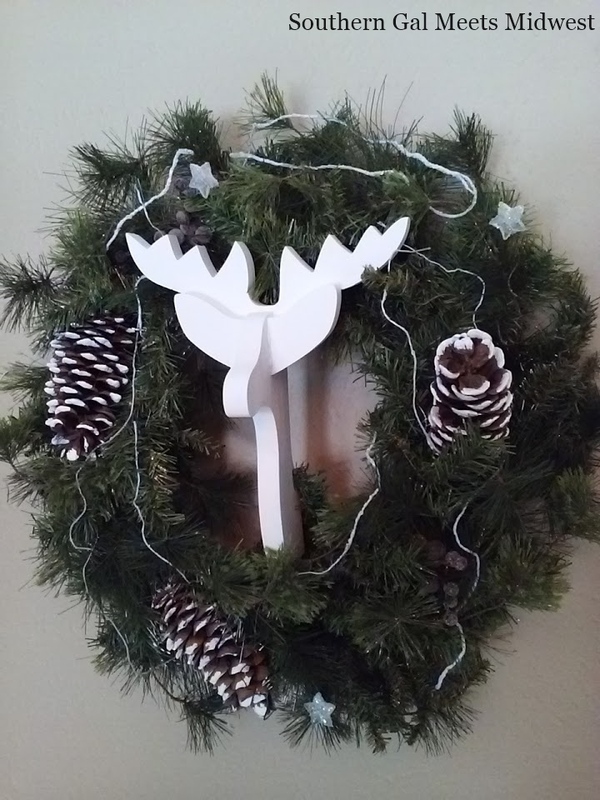 Two coats of chalk paint and some craft wire stapled to the back of his head and the neck (was not sure if this would work) to attach to an old wreath and we are on our way!! I added some pine cones and a few twigs that were painted white and some small glittery stars. Keeping it simple gives it a much more natural woodland look. That's it, he is finished! 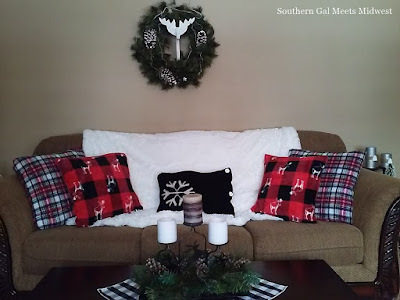 This wreath is over my couch so to keep the theme going I decided to create some fun pillows! I used an old blanket to stitch up the larger plaid pillow covers and purchased a checked throw with moose print from the Dollar Store for $3.00 to make covers for the smaller pillows. 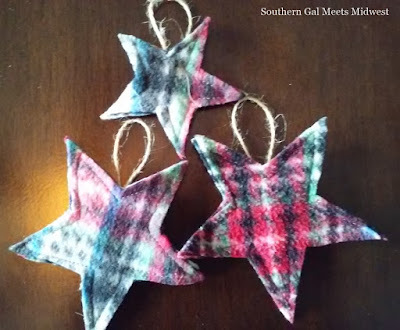 There is leftover fabric from the blanket and that is being used to make some little stars for the living room tree. 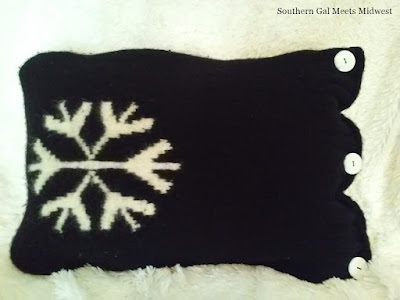 I also have a big piece of the throw remaining but am not sure what to do with that yet. I used a stencil to trace the stars but cookie cutters would work well too. Mine are just two layers stitched together and some twine attached to the back. They are a good use of leftover fabric and will help to fill in the tree nicely. Another pillow for the couch was made with one of my sweaters that got washed and thrown in the DRYER!! 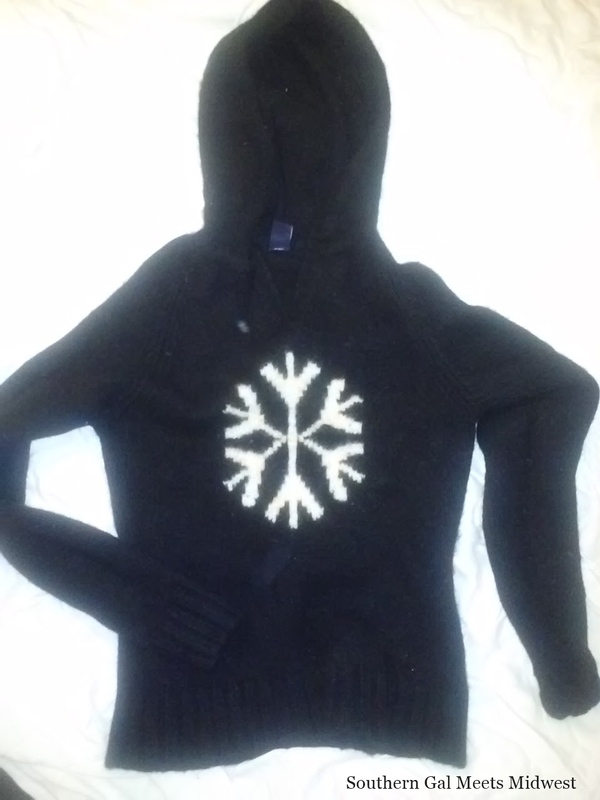 :( I won't say who did it my darling but when it came out of the dryer it was looking like a nice sweater for a 5 year old...I was sick over it! So here it is in it's new role. It was so small that there was only enough to make a lumbar pillow. 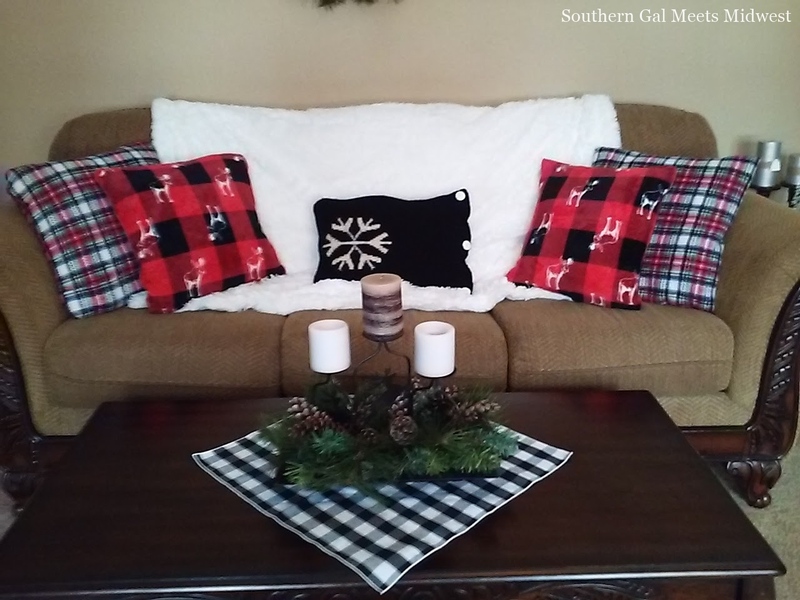 A candle centerpiece atop a buffalo check napkin on the coffee table and a winter white throw shows off the colors of the pillows. Thank you Diana, package toppers sounds like a really neat idea! I'm so glad you shared--you'll be featured at Thursday's Vintage Charm party this week! I was really impressed with each and every repurpose, Karen! Karen I love your homespun made with love Christmas décor. What fun to create and reinvent Holiday beauty. Karen, such a cute look and so cozy too. 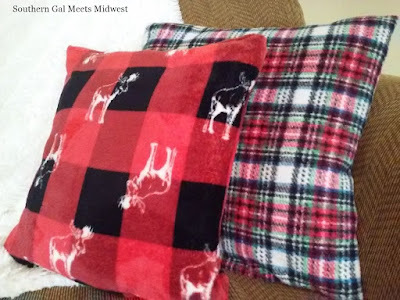 Being thrifty is wonderful and I so appreciate your lovely post. You are so incredibly talented, Karen - I truly wish I could sew!!! I love what you've done, can't wait to see more! 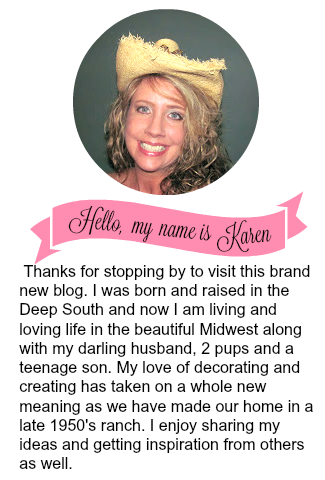 Hi Karen, Love your creations and Christmas decorating. You are so talented and I love these darling designs. Homemade treasures are the best aren't they? Your sofa looks so inviting and cozy for Christmas. 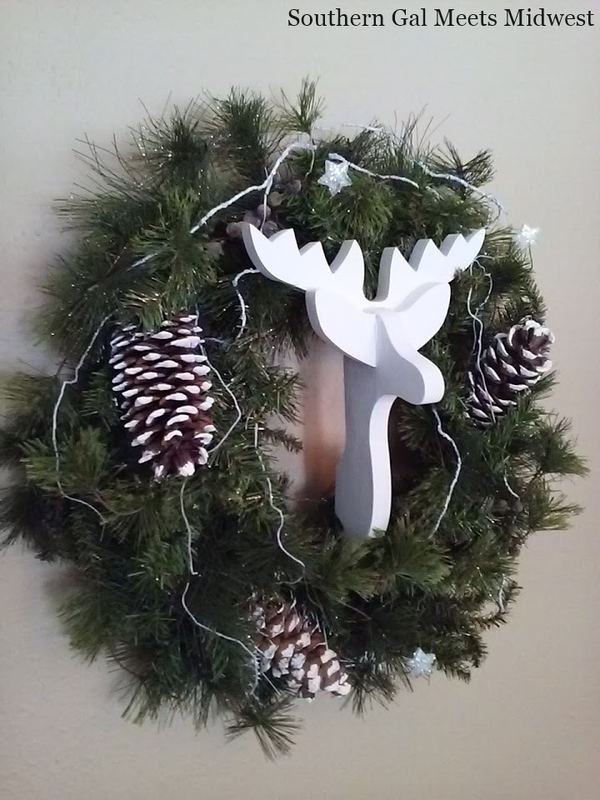 Love the wreath too. Who's Got Time for Breast Cancer?? Copyright © 2013 Southern Gal Meets Midwest. All Rights Reserved.